Managing fraud, recognizing speech, and creating more autonomous robots are just three areas that use artificial intelligence to come to grips with complexity. In this panel, industry and academic experts Tara Sainath, Lydia Kavraki, and Jin Zhang discussed how they use cutting-edge techniques such as deep neural networks and path-finding algorithms to solve real-world problems. 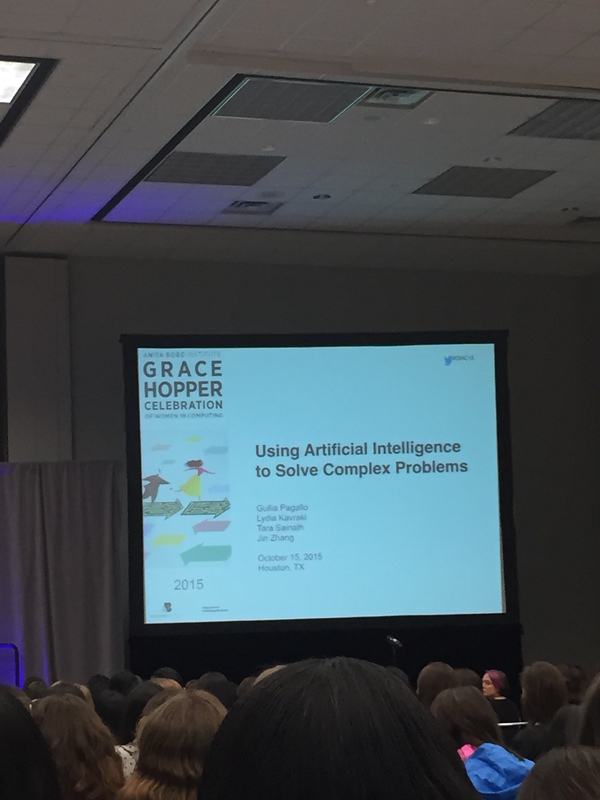 Today I attended the Artificial Intelligence to Solve Complex Problems session. The speakers in this panel were Tara Sainath, Lydia Kavraki, and Jin Zhang. I found all of the topics covered in this session very interesting. Below are the responses of the panelist for each question. How did you get into your field of study? Lydia shared her very relatable experience in grad school that helped her to get into Robotics. Much like my experience, she kind of stumbled into the field and found that she loved robotics! She wen on to briefly speak about the advancements of robotics. Tara Sainath: Tara started in AI because a professor asked her if she would be interested in it. She gave it a try and fell in love. She went on to get her masters and PHD. Again, I can really relate. I too stumbled into research after working with a professor for my senior project. Jin Zhang: Jin started in Graduate school working as an RA. She first associated data with building applications but realized that the world was ran on large databases. She expressed how cool it is that we now have the ability to collect data and serve it right back to customers. AI has given us a lot of capabilities in data management and analysis. Lydia: Senses have really helped with collecting data in AI. Computing the data has driven research for so many years. Robotics learning to work with humans is continually developing as a result of research. Tara: Tara works with acoustics modeling. This involves feature recognition and translation modeling and signaling modeling. Single biggest advancement is speech recognition is decreased error rates. Error rates have gone down because of the large amounts of data collected over time. Gin: Gin stated that AI has drastically helped with problem solving. There are all common data points such as pass codes and security questions. She explained that there is a delicate balance where we need to know how much info is enough to know who is who. She was able to deploy a risk factor score that boiled down to – how can we quickly identify thumbs up or down with out inconveniencing the user. AI has allowed us to detect this information with out bugging the user. AI has opened up an angling approach to problem solving. She went onto explain how once you have data you have to process it. Its important to consider where and how is it processed. Now we ask questions like -What are we looking for? AI is powerful because it can show us what the data means with out us even knowing what to look for. How are Deep neural networks used in acoustic modeling? Tara: Tara uses deep neural networks in acoustic modeling. The benefit is that they had GPUs to train faster allowing for more layers. Training models involved, 1- reduce speaker variations and 2- discriminate training packets. Lower layers of the network capture speaker variances. Neural networks are great at feature recognition. More recently she has been looking into computation neural networks. How are deep neural networks used in robotics? Lydia: Lydia explained how neural networks are used differently. In other fields you know what the answer is and know what you are looking for but in robotics that is not always the case. She imagined that it will become more prevalent in robotics in the future. What enables neural networks to be successful in your apps? Gin: She explained that at one point there was a lot of complicated data but we weren’t processing it fast enough. The cloud has drastically help us to speed up the process. Genome sequencing used to be costly but now it is a lot less costly because of cloud computing. She expressed how she relies heavily on computing power. What kind of data allows you to do your research? Lydia: In robotics you produce a massive amount of data. Its used in many ways. Data is sent to the cloud , sensing data etc. The big questions are, what kind of data is needed, when to use it, where to store it , and how is it applicable to robotics? Speech recognition- how do you leverage all the data? Tara: Neural networks. If she trained her data using GPUs it would take a long time. Amazon uses GPUs but they quantize the machine to speed it up. IBM specializes software architecture that speeds up processing. Its important when solving complex problems to look at cross platform efforts in different fields. What suggestions do you have for researchers to make connections? Lydia feels that we all have the responsibility to be open minded. She highly suggested that researchers look into fields that they aren’t working on for inspiration. She went to talks, and did research on complex algorithms. She was facinated about what she found on how people viewed emotion. People were willing to listen to her but she also had to listen to others. She went to talks and learned the language, terminology of the field and became engulfed with what she was learning. Dont talk about features to customers that are not in the same field because you will confuse the heck out of them. If you are talking to a data scientist or then feel free to talk about your data science features but other wise zip it. This was a great session! I am so glad that I was able to attend and capture such great information. I am currently working on an AI project and am starting to learn more and more about models such as Neural networks. Hopefully I’ll be able to connect with one of the speakers before the conference is over!